These front Servo/Battery plate allow Axial AX10 owners to put the weight of the servo and battery over the front axle for better rock crawling performance. These plates are CNC Machined (not stamped aluminum plate) for increased durability and brilliant part finish. 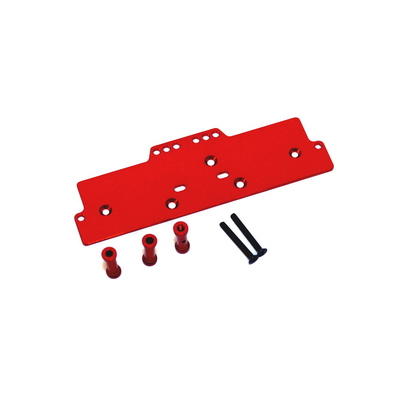 Our servo/battery plate also features 4 link upper link mounting option (in 3 different width adjustments) These adjustments allow for more suspension tuning options and also better control against motor torque twist. Finally, our servo/battery plate gives you the option of mounting the steering servo either right biased or left biased with two sets of servo mounting holes drilled. Each kit contains aluminum servo steering post and vertical aluminum mounting posts, and all available at very affordable prices.